My journey brings me to a nearby prairie slough where prescient reflections shimmer under the summer sun. Today, I am in pursuit of mythical enlightenment. You know, the kind where magic resonates in the shriek of a hawk and in the howling yips from the coyote pups that play on the sandy shore under a full moon. The alchemy of the moment is not lost on my hungering soul. As I gaze into the pond, I see the reflections of the woman I’ve become, Past and future meld as one. For today, the wisdom I seek is my bond with the one. 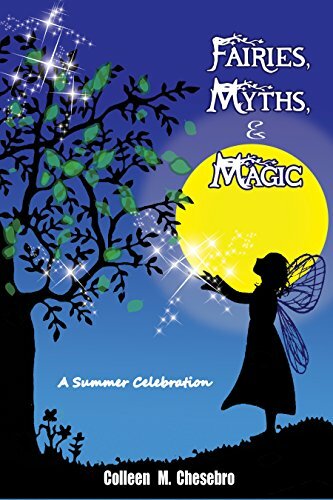 The tagline on this book is A Summer Celebration, and what better day to read it than on the summer solstice. Chesebro’s book is a collection of poetry and short stories that celebrates not only the presence of summer, but the connection of the human spirit to the Earth, a bond that is ancient, new, and eternal. Some of the selections are playful like the mermaid bedtime story “A Fish Tale.” Or endearing like “Just What the Doctor Ordered,” in which two pixies get soused in a pitcher of mojitos. Others like “The Healer” take on mythic proportions and read like ancient legends. But most delve into the mysterious and magical nature of the world around us and our journey through it. The theme of rebirth and self-discovery appears in both story and poem form, and these were perhaps my favorites because they felt both personal and universal. “The Rebirth” is a gorgeous haibun/tanka poem. “The Fairy Spider’s Lair” is full of Earth magic, and “The Pond” is a story that spoke to my soul. Just gorgeous. I could go on and on, but you’ll have to pick up this book and read them yourself. 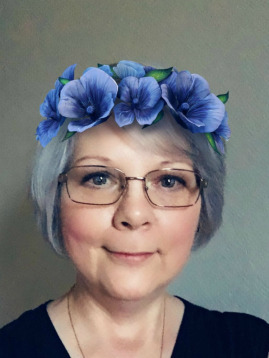 Colleen M. Chesebro is a writer of YA fantasy and magical realism, cross-genre fiction, poetry, and creative nonfiction. She loves all things magical which may mean that she could be experiencing her second childhood – or not. That part of her life hasn’t been fully decided yet. A few years ago, a mystical experience led her to renew her passion for writing and storytelling. These days she resides in the fantasy realm of the Fairy Whisperer where she writes the magical poetry and stories that the fairy nymphs whisper to her in her dreams. Colleen won the Little and Laugh Flash Fiction Contest sponsored by the CarrotRanch Literary Community.com in November 2017 for her piece, called “The Bus Stop.” Her debut novel, “The Heart Stone Chronicles: The Swamp Fairy,” won gold in the 2017 AuthorsDB.com cover contest.